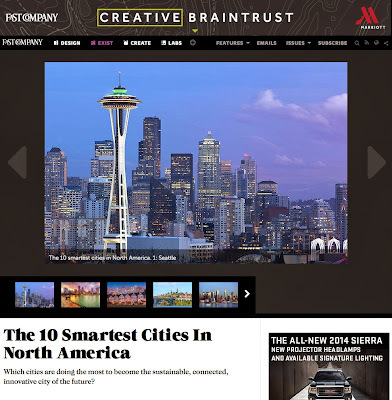 Fast Company's Co.Exist site, the company's sub-site that focuses on world-changing ideas and innovation, just named Seattle #1 on its 10 Smartest Cities in North America list. According to Fast Company, Seattle was the clear winner in the Smart Economy and Smart Government rankings and came in second behind Washington, D.C. in the Smart People category. Fast Company called out that many of Seattle's sustainability and innovation accolades in their reasons for the high ranking, including the Bainbridge Graduate Institute, Sustainable Seattle, and Climate Solutions. The list author, Boyd Cohen, specifically called out The Happiness Initiative, incubated in Sustainable Seattle, which aims to measure the level of local happiness, stating that it is "something I consider to be a core objective of smart city programs." Congrats to the great city of Seattle! Future-ish is proud to call Seattle home!! !